To see this recipe or to view step-by-step photographs, please visit the original blog post on GrilledCheeseSocial.com right [HERE]. Begin by mixing up your french toast batter. Combine the aforementioned ingredients in a medium sized bowl and whisked until batter was smooth. Set aside. Take a heart shaped cookie cutter and cut out 3 1" wide hearts. In a large frying pan, melt butter and turn the heat to medium. 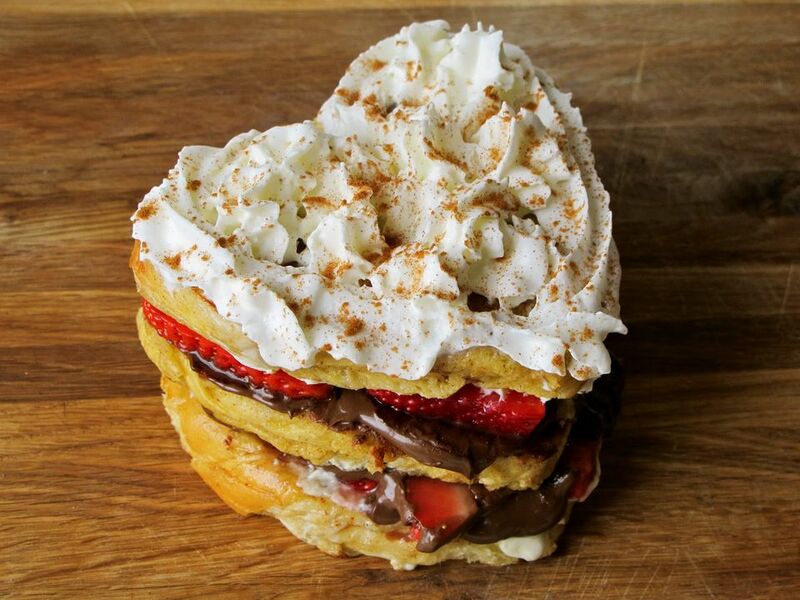 Dunk the heart shaped challah bread in french toast batter quickly and place the bread in the frying pan. Let them cook for a few minutes on each side until the french toast batter begins to turn light brown and starts to get semi crispy. Once they're done remove from heat and set aside. On one heart, smear on 1 tablespoon mascarpone, then add the strawberries. On the next heart, smear on 1 tablespoon of nutella and place that piece, nutella side down on top of the strawberries. Add more mascarpone and another layer of strawberries and repeat until stack is complete. Top with a giant squeeze of whipped whipped cream and a dusting of cinnamon if you're into that.